When we purchased our home, one the most exciting aspects was having a blank canvas to decorate exactly the way we wanted. I feel confident adding color to my wardrobe, but normally gravitate towards neutrals when it comes to furniture, since I feel the tones provide a classic feel. 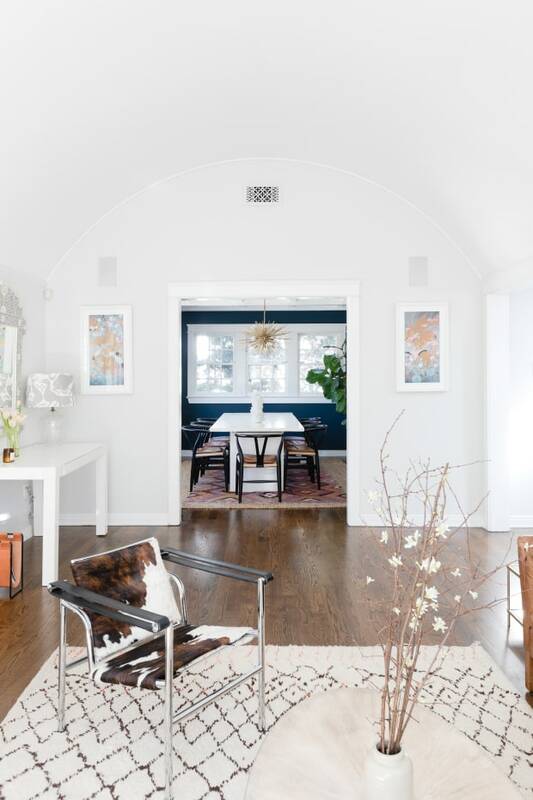 When I asked Amber to help decorate our home, I was initially averse to some of her colorful suggestions, but then I saw how – when anchored by neutrals – a little color can have a major impact, I was totally game. 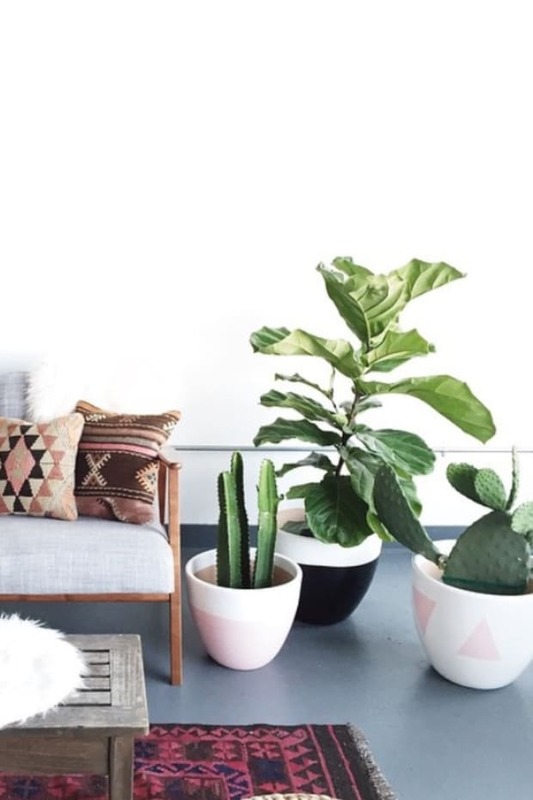 Here are some simple ways to incorporate color into your home. Color coordinate your books. 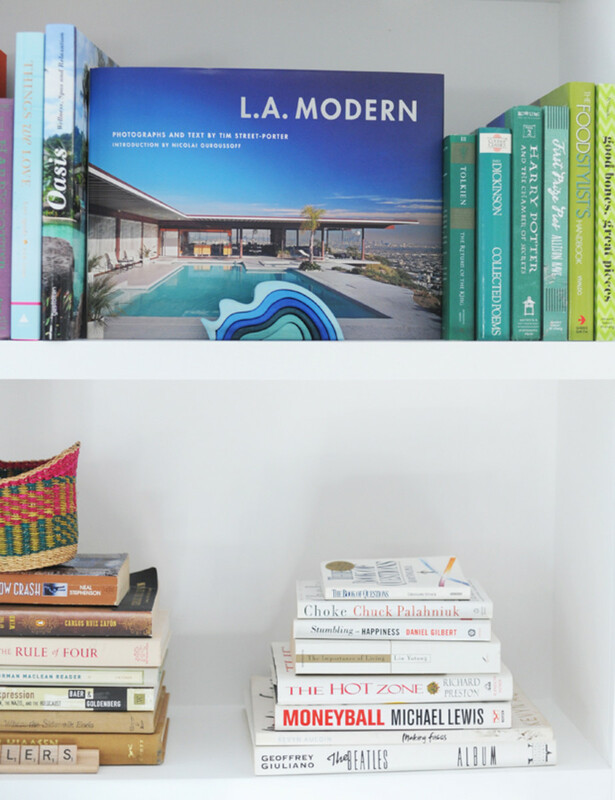 If you have a large display for books, color-coordinating your favorite reads can be an easy way to make a statement. You can also use this area to place some other fun or sentimental colorful items as well. Liven up a bar cart. A bar cart doesn&apos;t need to be masculine and boring. In fact, I find that this is an overlooked corner where I can infuse a ton of color. I lean towards bottles of liquor with bright labels and fun, bright glassware that would normally be stored in the back of our cupboard. You can also keep fresh herb garnishes (like mint) in a bright bud vase for another colorful addition. Large scale linens. 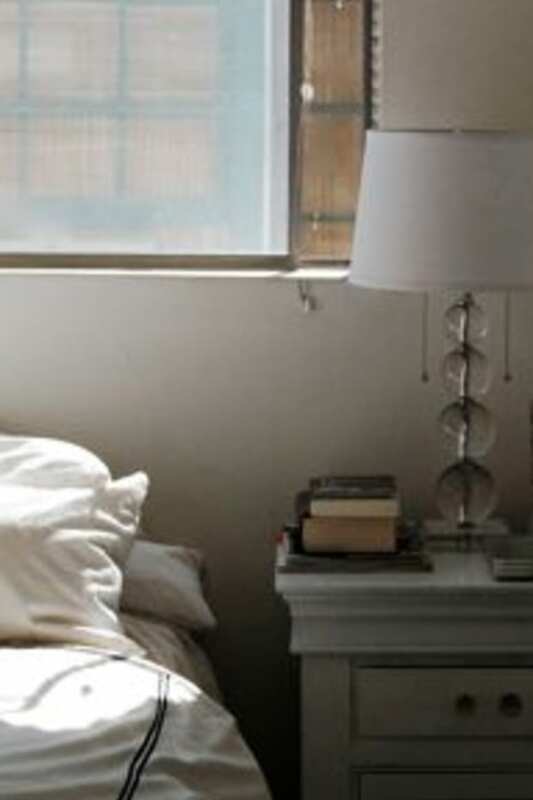 A colorful blanket at the foot of your bed can help punch up basic white sheets, or infuse color onto a basic armchair. This is great because it&apos;s a large swath of color, but with little commitment: If you tire of the fabric, fold them away into your linen closet until you’re ready once again. 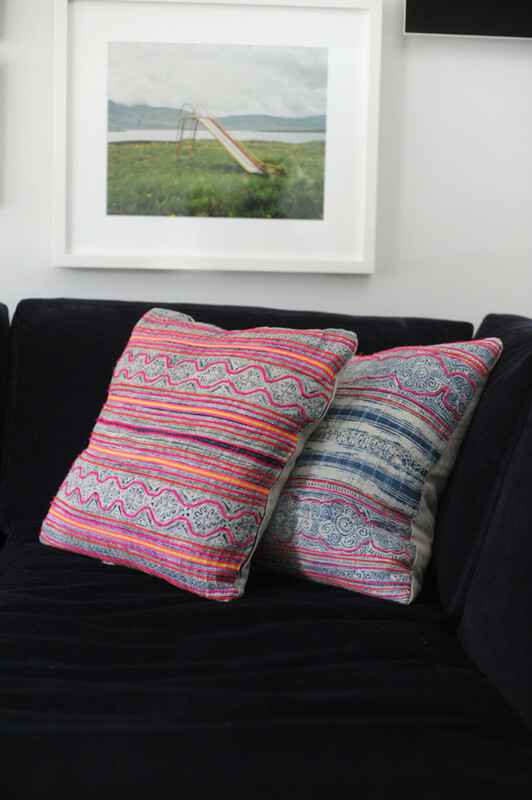 Add a bright pillow covers to your couch or bed. This is easy, affordable, and a quick change. Just buy covers and all you need is stuffing from your local craft store to fill them up. 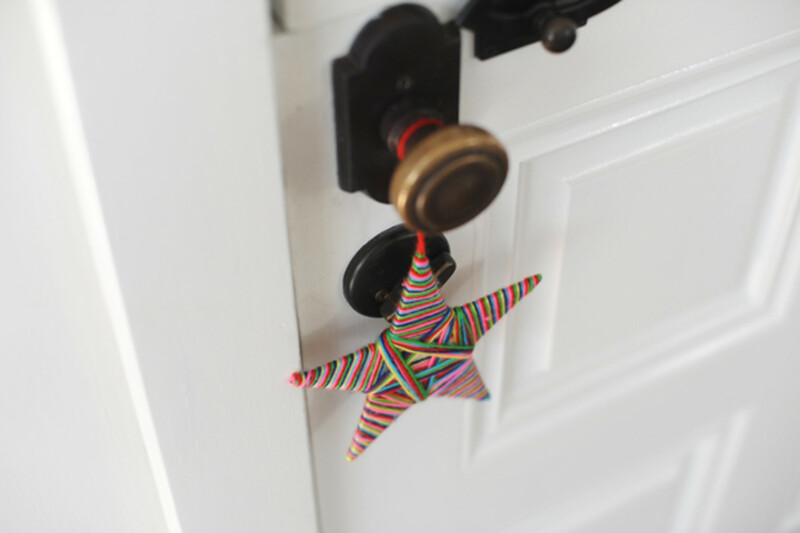 Hanging on doorknob. I’ve found that choosing lesser utilized parts of the home are optimal for adding a little color. I hang this good luck charm on the knob of our front door. It&apos;s a small and sentimental way to inject a little pigment to an all-white door. Exposed neon tray on your coffee table. I have lots of trays in my house. They’re not only functional for dinner parties or having lunch on the couch, but I use them to corral some of the loose knick-knacks that I love to keep on display. I stock simple lacquered white ones in spades, but my most-loved tray is a bright, neon iteration that steals the show. Bold Wallpaper in small places. If you’re willing to invest in wallpaper, but don’t want to fully commit to a room, choose a smaller space in your home. 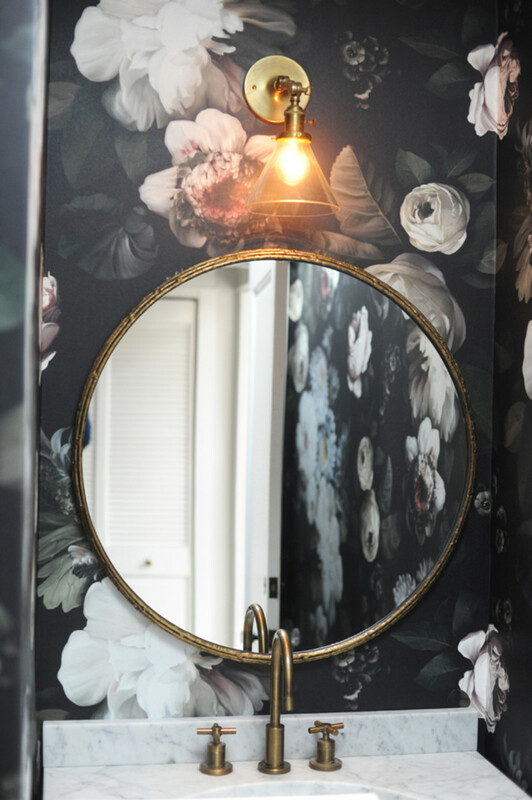 We did our powder room in an oversized floral print. A good, colorful wallpaper could also work in a smaller area like the inside of a drawer, the back of a closet or bookshelf. Ombre stack of coffee table books. There’s a method for curating a good coffee table set-up, and it&apos;s also a good place to inject a little color, too. I buy big art books and display the ones that have the most attention grabbing covers (oftentimes in a pretty gradient). Curtain tie. 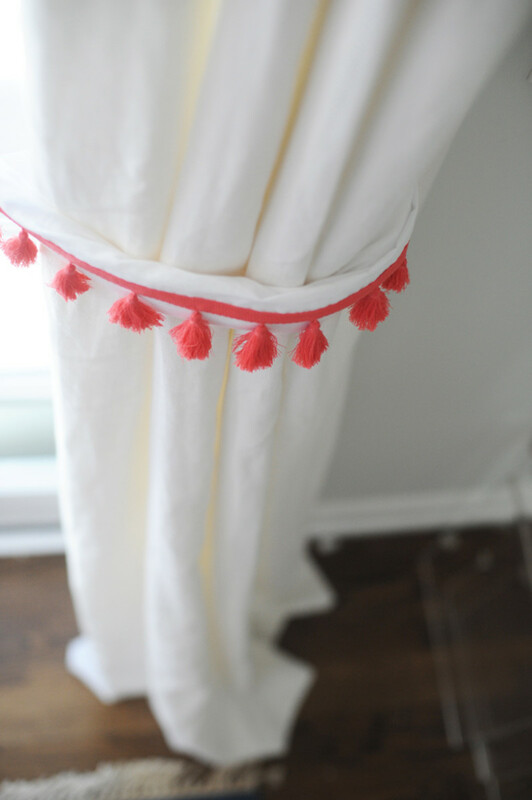 We have standard cream linen curtains in our home, but use a bright coral tassel as curtain ties in our daughter’s room. 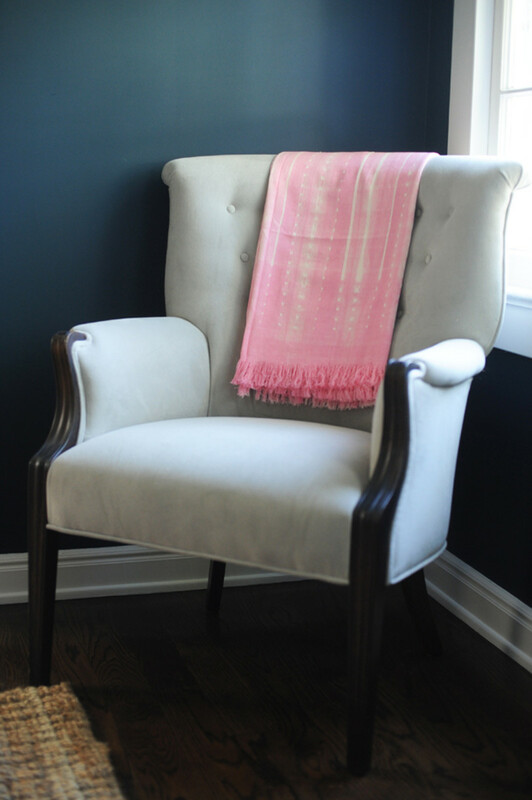 Even this little bit of a bright hue can make a big difference against a plain backdrop. Bright nail polish displayed in a hurricane. I have a ton of nail polish at home and though the majority of it lives inside of my drawers, I like to put my favorite colors in a clear hurricane and leave it up on a bathroom shelf. Not only is it a good way to organize similar colors, but keeps some long-forgotten colors top of mind. Single accent rug. 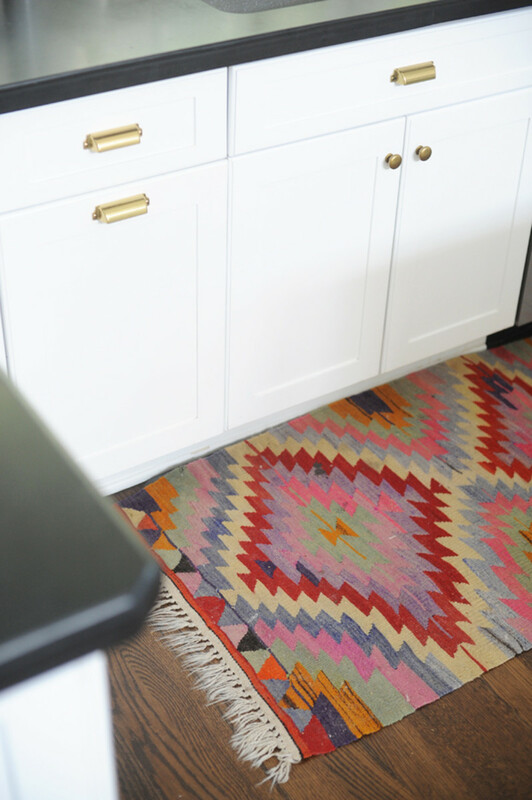 Most of our rugs are neutral, but I like to be bold with accent rugs. The one we have in our kitchen is vintage, and its bright colors bring levity to our all-white, marbled and brass kitchen. In a way, I feel like it makes the kitchen more casual, which is what a kitchen should feel like. Bright details like coasters. Smaller items are the perfect place for color. I could have bought basic, plain ones, but instead went for bright otami print ones. We always get asked where we bought them. For full shots of our entire house along with entertaining ideas, you can buy Cupcakes and Cashmere at Home, here.